While I always appreciate a value, if the food’s not tasty, the place isn’t worth a return visit. At least not for The Crusty Old Expat. 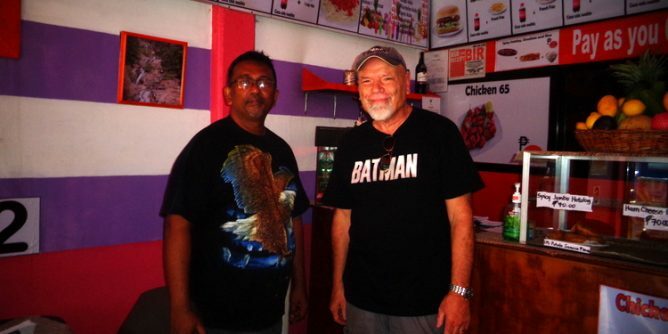 However, NAMIT Burger, near the New Site in San Miguel, Jordan, Guimaras, is worth a return stopover and then some. It’s located a couple of doors down from Baby Central. Sri Lankan Rave Abeykoon and his charming Filipina wife, Marizel, are the owners of this culinary jewel and proud parents of three children. My asawa was shopping at the Hypermarket in Guimaras. We were parked across the street near NAMIT. I waited inside our Ford Ranger. I rarely leave the truck when I’m waiting for my spouse. In contrast, I decided to hop out of our truck this time to investigate this new eatery. I noticed a good deal of tricycles pulling up to the establishment and leaving with takeout orders. A good friend had dined there some time ago and remarked on their tasty burger, fries and drink meal that only cost 80 pesos, $1.60 US dollars. After entering the eatery, I was greeted by a Filipina staff member who quickly referred me to the “boss. The boss, Rave, is not only the co-owner but also the cook. A very friendly man from Sri Lanka. While I spoke to Rave, I kept an eye on our Ford Ranger awaiting the return of my wife. I had locked the truck. She would be returning with groceries. I had a pleasant conversation with the affable Rave. Several minutes passed by and I spied my asawa trying to get into our vehicle. I quickly said goodbye to Rave and promised to return. Two weeks later, we had occasion to return. We were awaiting word on our new Cignal Set-Top Box and had been parked outside the Genesis Cignal Office in San Miguel. We were out late. It was 6:45 pm on a Thursday. 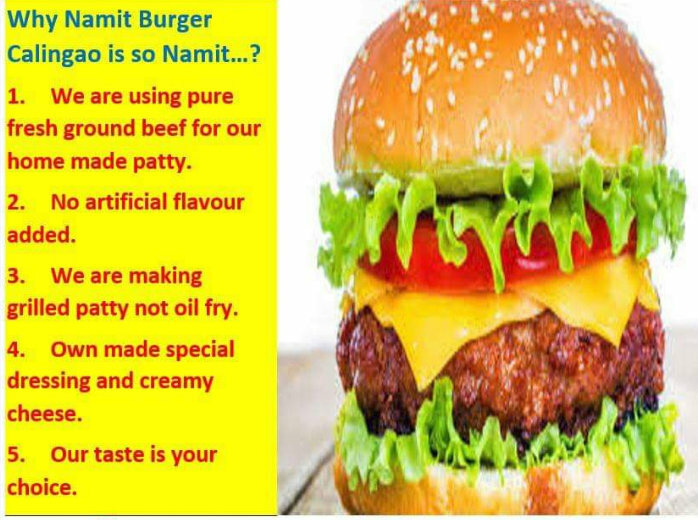 However, the digital box was not ready for pick-up yet so I decided to swing by NAMIT Burger for some takeout. We placed an order for two NAMIT Burger combos, a double patty burger topped with bacon. It came with an order of French fries and a 200 ml bottle of Coke. The price? Only 108 pesos, two bucks. My wife, who due to problems with gastritis cannot eat any red meat ordered one of the most “expensive” items on the menu, Chicken Biryani, at 148 pesos, almost three US dollars. Total bill? 377 pesos, $7.50. While we waited for our order we sat down, entertained by one of Rave and Marizel’s children, a young man, who was showing off his break dance moves. A very family friendly place with a great atmosphere. It wasn’t long before our takeout order was ready. I thanked Rave and we took off for home. One of the burger combos would go to our niece, Shaina. Our niece is tutoring at her auntie’s preschool and is awaiting the results of her Teacher’s Board Exams. The burger was absolutely, “namit,” very tasty! Frankly, for the price, I didn’t know what to expect. My wife enjoyed her dish and noted that the rice was very delectable and had a delicious curry note. 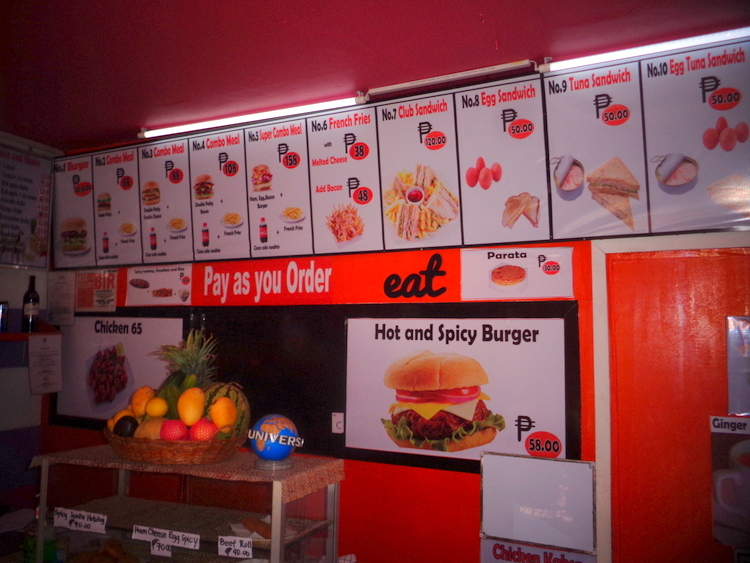 We definitely will return to NAMIT Burger in Guimaras very soon for some more takeout delights. Hours are from 7 am to 8 pm. I returned several days later to take the photographs seen in this article. I wanted Rave to know how much I enjoyed the food and that I would be writing this completely unsolicited review. NAMIT BURGER: Guimaras’ Best Burger Bargain? You bet!